The classic sling design with metal snap and connector hook. In black and well constructed by Ludwig Drums. Three point sling from Pearl that provides support over one shoulder and around the waist. 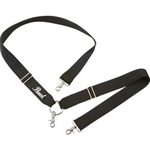 High quality metal and fabric make this a durable product at an affordable price. Metal leg rest for snare and tenor (15, 16 &18"). Foamed cup for comfort and quick release design for storage. Light weight and well designed. Nylon and metal construction imported from Canada. Includes a sling for over the shoulder and waist belt combination to take some of the stress from your shoulder and steady the drum at the same time. Manufactured with high quality 2" wide black leather and silver metal in Canada. Adjustable and sturdy design with ring to connect to drum hitch. Classic design of wide black leather and large silver buckle with ring to attach drum. Made with top quality materials and imported from Canada.